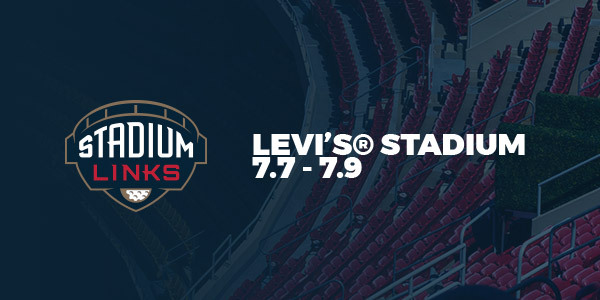 The San Francisco 49ers have announced the addition of golf to the resume of Levi’s® Stadium this July when Stadiumlinks comes to Santa Clara for a three-day event available to golf fans throughout Northern California and beyond. Stadiumlinks, the event series that transforms prominent sports stadiums into exclusive golf courses, is bringing its one-of-a-kind, nine-hole golf course to the venue July 7-9. Tee time bookings are now officially available to the public at StadiumLinksGolf.com. Tee times are available across the three days of the event, starting early morning and ending in the evening, with the stadium lights illuminating the entire course under the night sky. Registration is available in two-person and four-person bookings with prices that start at $75 per person. A premium VIP upgrade will be offered during the registration checkout, giving participants the opportunity to hang out after completing their round in one of Levi’s® Stadium luxury areas overlooking the stadium at play (among other additional VIP perks that are included in the upgrade). Admission to Levi’s® Stadium to play the nine-hole course at a designated tee time. Eligibility to earn a share of the cash purse. Complimentary use of standard sized golf clubs at each hole. Nine complimentary golf balls to be played throughout the course. Private warm-up inside our netted practice bay. Nine additional golf balls provided with the player’s best ball at each hole counting toward their official score. Admission into the VIP Lounge with premium accommodations. One complimentary round at The Chipping Challenge. One complimentary round at The Putting Challenge.